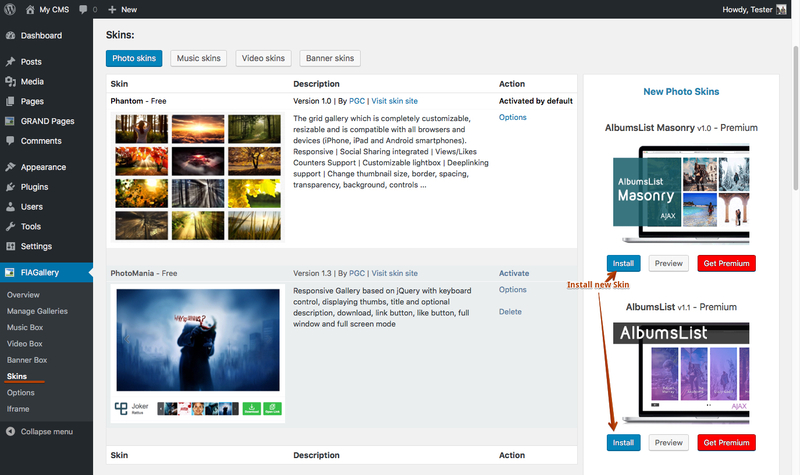 Download free GRAND FlAGallery plugin and install. After installing the plugin you need to activate it. The first thing you will want to do is upload some images. Before you can do that, you have to create a gallery. 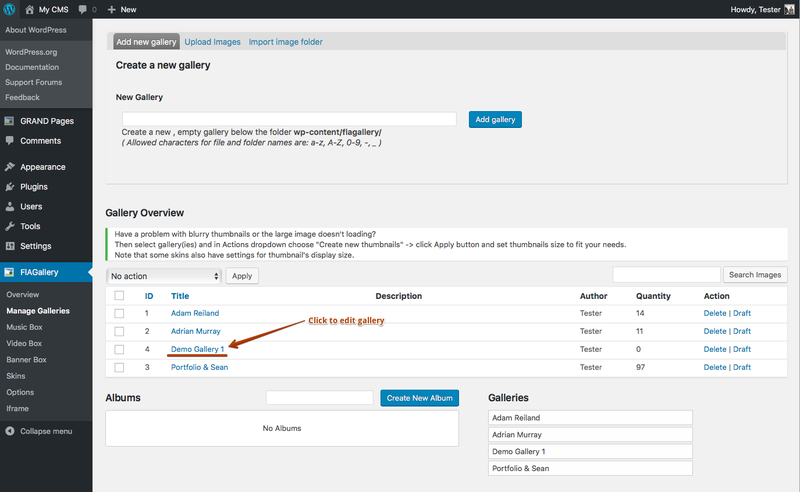 You do that on the Manage Galleries -> Add Gallery tab. 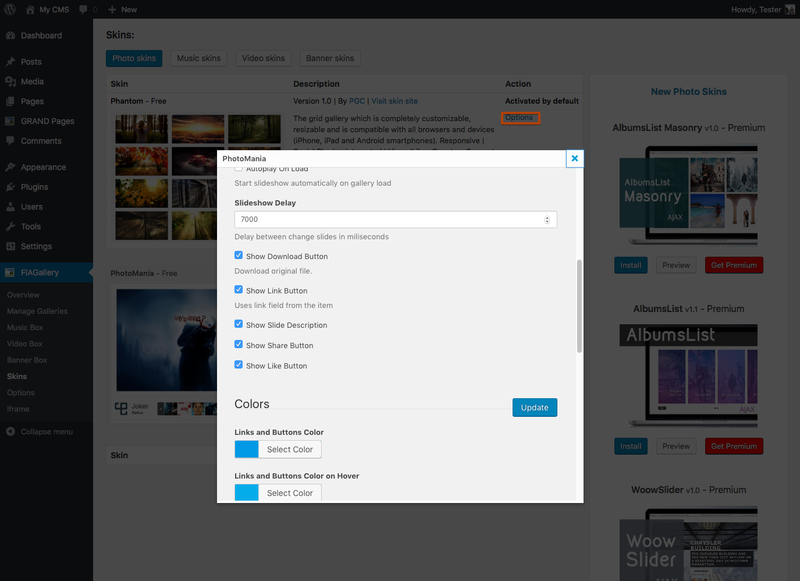 Galleries are created below the path specified on the General Options page, typically wp-content/flagallery/. 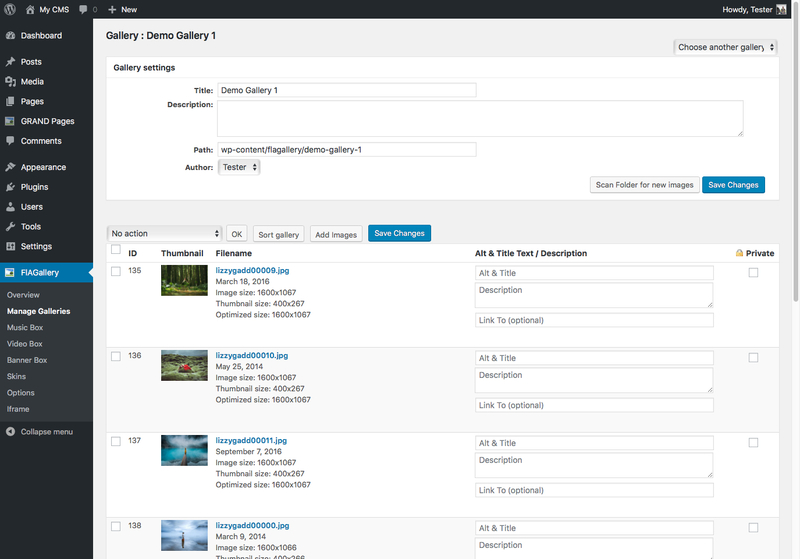 Creating a gallery actually creates a new folder on the server to store the images. Choose the name of your gallery very carefully as once it’s been created it is very difficult to change it. You’ll have to rename the folder on the server’s disk. Edit the name and description of the gallery. Edit the path (although this only changes the path, it doesn’t rename it). Once you’ve created a gallery you can add images to it. There are two different ways to add images to a gallery, by uploading them and by copying them to a location and then scanning the directory. Upload images one or more at a time. This is done from the Upload Images tab on the Manage Galleries page. 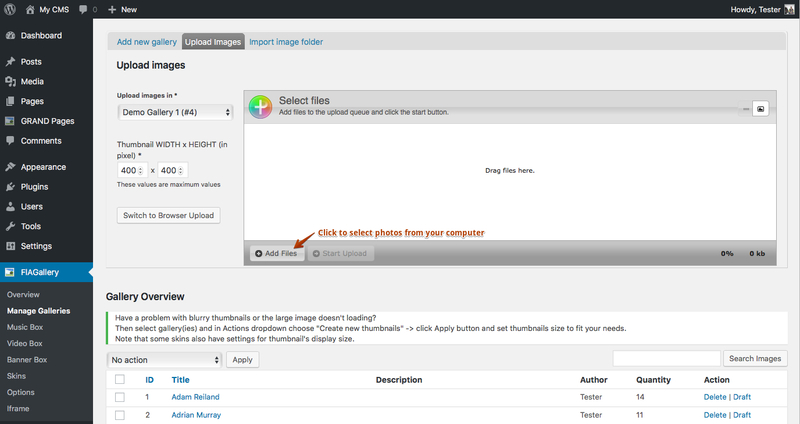 You can select multiple files to upload and see progress of each image as it is being uploaded. Note that when uploading images, check that the php.ini file for your server sets the maximum file upload size high enough. Go to the Manage Gallery page. Click on the Edit link for your gallery. 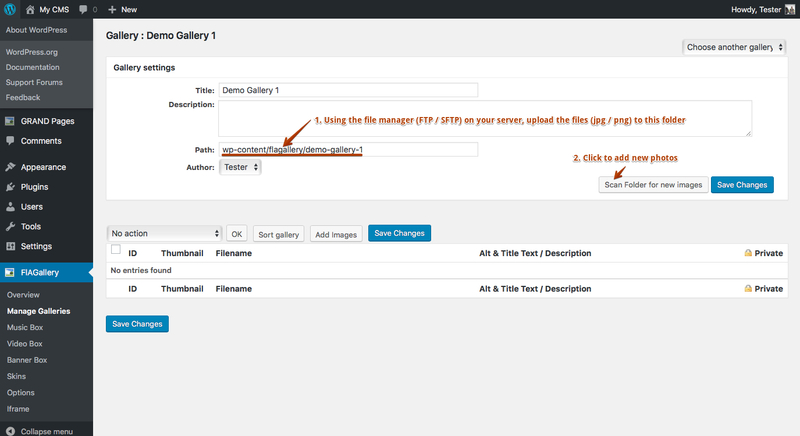 Using the file manager (FTP / SFTP) on your server, upload the files (jpg / png) to this folder. Click the Scan Folder for New Images button. 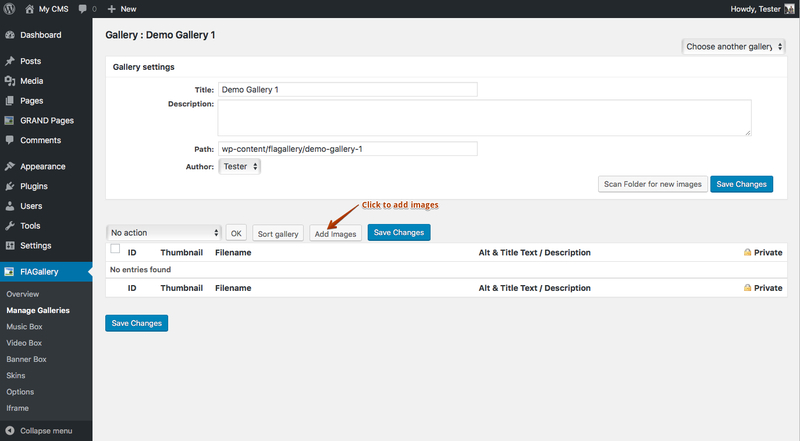 Once you get images into a gallery, you can perform a number of different operations on them. Probably the first thing you’ll want to do is to annotate them. While you’re at it you may as well add a description to your gallery. The Menage Gallery page provides a lot of flexibility and allows you to make a lot of changes at once. One thing you’ll want to be careful of, however, is to avoid doing to many operations that take a lot of time, such as regenerating thumbnails. Doing so can cause the operation to timeout. 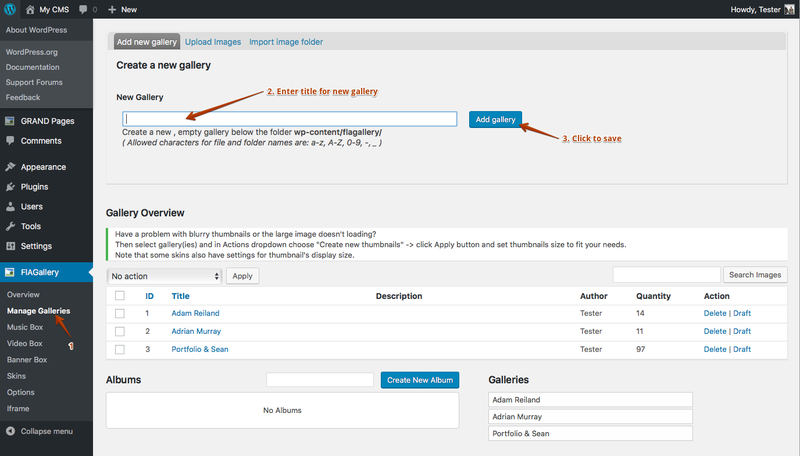 Here is a summary of the operations that can be performed on images on the Manage Gallery page. Specify a description for each image. Specify alternate title text for each image. Delete an image. The image file itself will only be deleted if the Delete image files option is enabled on the General Options page. Generate new (create custom) thumbnails for selected images. This is especially useful when you change the thumbnail options. Resize images. This is useful when you set resize parameters on the Images option page. Scan the folder for new images as described above. Sort images. Only when Custom order option is selected on Options page. Lock images for unregistered users. All new skins and updates will be available in the right sidebar. Each gallery can have its own unique look. This shortcode will display all galleries (except ID=3 and ID=5) sorted by title, ASC order. 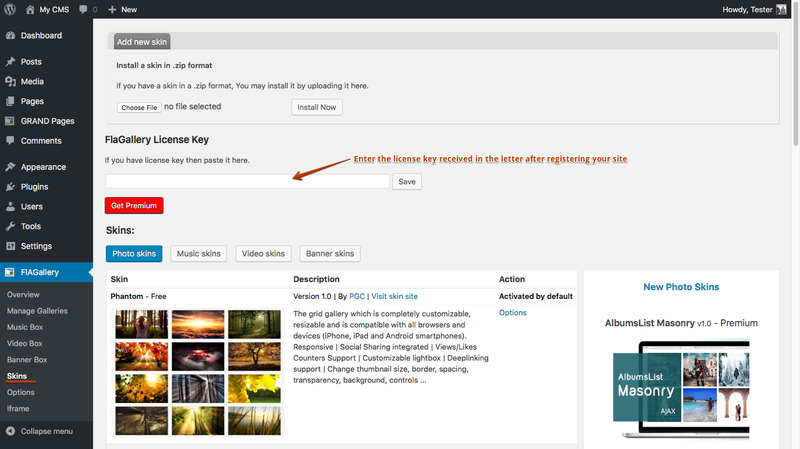 Above shortcode will display first gallery with ID=4, then with ID=2 and ID=5 in flash categories. Enter the license key received in the letter after registering your site.